We all have the causes that are close to our hearts right? Well, male depression is something I feel very strong about. In this day and age men are told to be tough and not show their emotions. If they are sad, they are perceived to be weaker and while more women than men are diagnosed with depression, this may partly be because many men don't seek the help they need. They don't talk about it. And the suicide rate reflects that. Australian data (ABS, Causes of Death) reports in 2012, the most recent recorded year, 1,901 males opposed to 634 females died by suicide. While not all suicide is depression related, it is a leading factor. Movember is an amazing event because it raises awareness and helps fund programs for both prostate & testicular cancer, but also mental health issues. Issues that go un-talked about and ignored. 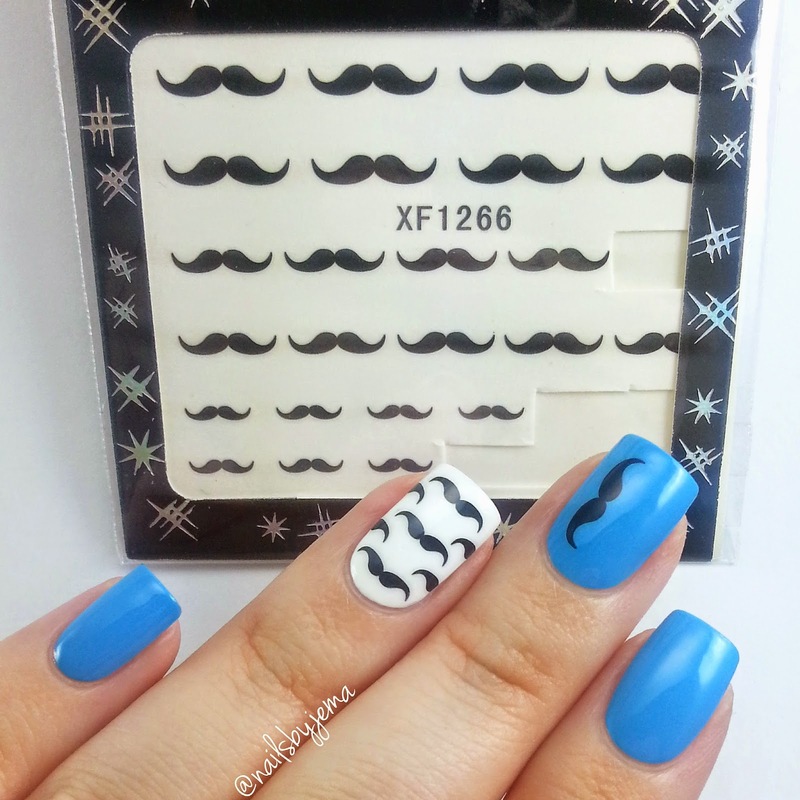 So these are my Movember nails. I am obsessed with the feature nail of this too so it might be sticking around for a couple of manis! 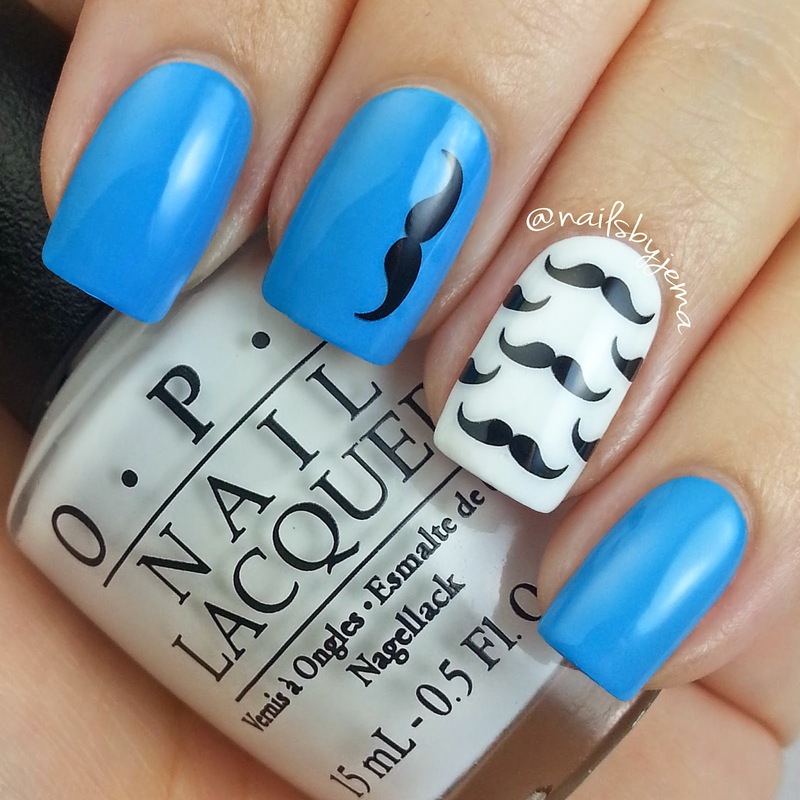 I used OPI 'Alpine Snow' & 'No Room For The Blues' and moustache water decals from Born Pretty Store. They are so easy to apply and they look so great once you top them with polish so they don't wash away. Use the code GBJ61 to get 10% off and free shipping from Born Pretty Store. Here are the water decals I used, with a nail photo bomb of course! I think that while I am in a position to reach a lot of people and raise awareness, that I should. I understand that the majority of my followers/readers/likers are female, but if you can see the signs of depression, you can help make a change in someone's life. Don't let depression take away the men you love. Chevron Nails With A J and KITTENS! !